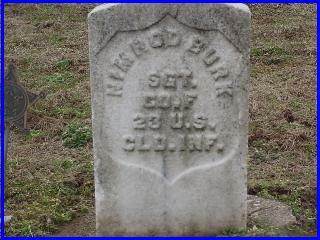 This is the true story of my great-great-grandfather, Nimrod Burke, a veteran of the American Civil War (1861-1865). 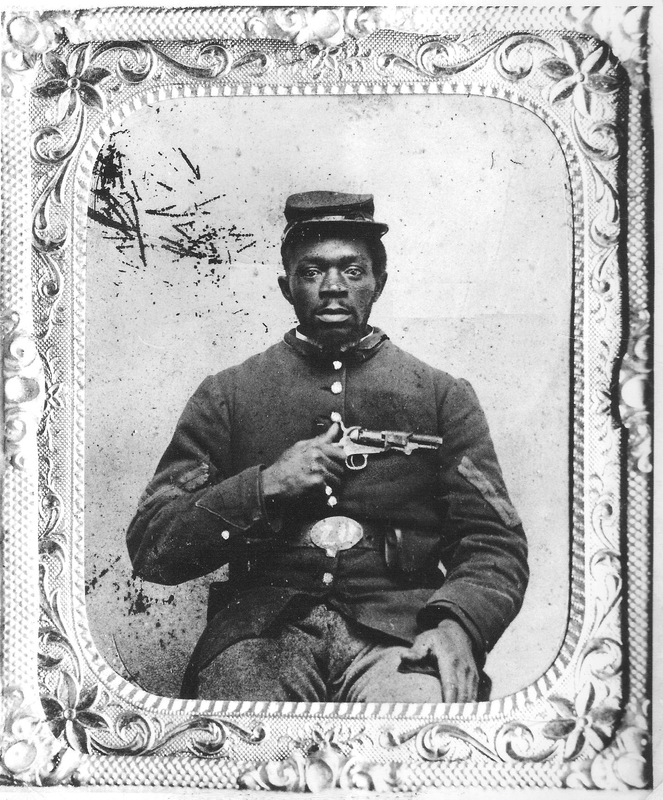 Nimrod served as First Sergeant for Company F, 23rd Regiment, US Colored Infantry. He was born in Prince William County, Virginia, the 2nd son of Joseph and Hannah (Gaskins) Burke. He lived most of his life in Washington County Ohio, and is buried in the Fourth Row, Soldiers Circle, at Greenlawn Cemetery, Chillicothe, Ohio. Washington County, Ohio sent over 4000 men to fight with the Union Forces during the American Civil War (1861-1865). During the early part of the Civil War, until late in 1862, official policy was not to enlist African Americans in the capacity of fighting men. African Americans involved in the early phase of the Civil War were civilian laborers, teamsters, servants for high ranking Union officers, and as in some cases my g-g-grandfather Nimrod Burke, some were teamsters and scouts. After black men were allowed to enlist, more than 200 African American soldiers from Washington and surrounding counties enlisted in the Union Army. Nimrod Burke was born in Prince William county, Virginia in 1836 and he had lived there until at age eighteen in 1854, he came to Washington County, Ohio with his parents Joseph and Hannah Burke. Nimrod's father, Joseph Burke was ill when he and his family had crossed the Ohio River into Newport in late November. During the early part of January 1855, Joseph Burke died at age 57, and left his widow Hannah with several minor children to care for. Life was very hard for Hannah Burke, but she was a strong and determined woman. Her children that were old enough quickly found jobs. Nimrod and Van Buren went to Marietta, where Nimrod was employment as a handyman by an abolitionists lawyer named Melvin C. Clarke. Clarke soon learned that he could depend on Nimrod and Mr. Clarke became very fond of the young man. He taught Nimrod to read and write, and to tally figures. It was as if Clarke knew what was looming in the future. Meanwhile, Nimrod kept in close contact with his family. He spent as much time as he could with them, often traveling by horseback to spent week ends with them. Life continued to improve, and Nimrod began to grow comfortable. In the early part of 1860, Nimrod met a young lady named Mary Freeman, who had come to the area with her family about ten years prior. Mary worked as a domestic for a family that lived close to Clarke's place, where Nimrod stayed. After courting for several months Nimrod and Mary were married late in 1860! Life was rosy for the young black couple. They had begun to get a taste of freedom that they had not been accustomed to back in Virginia. Then on the morning of April 12, 1861, Confederate forces at Fort Johnson in Charleston S.C. opened fire on Fort Sumter, marking the beginning of the American Civil War! Melvin C. Clarke was appointed a Major in the Union Army and quickly raised some Companies in Marietta for the 36th Ohio Volunteer Infantry (O.V.I.). Nimrod tried to join the ranks of the Union Army, but blacks were not eligible to serve as soldiers. Instead, Major Clarke, knowing that Nimrod had been born and raised in Virginia, hired him as a teamster-scout for the 36th Ohio Volunteer Infantry, and they went off to Tidewater Virginia to fight the Confederates. Major Clarke was soon promoted to the rank of Lt. Colonel, and Nimrod was kept busy leading wagons back and forth from the train depots to keep the 36th Ohio Volunteer Infantry supplied. On September 17, 1862 fighting between the Union and Confederate Forces began the Battle of at Antietam Creek, near Sharpsburg, Maryland where General Robert E. Lee attempted to invade the North. The 36th Ohio Volunteer Infantry was in the thick of the battle. Clarke was promoted to full Colonel on that fateful day, but tragically, he was killed before knew of his promotion. General George B. McClellan commanded the 12,500 Union Soldiers and General Robert E. Lee commanded 13,700 Confederate Forces at Antietam. The Union won the battle, and the Confederates retreated giving President Abraham Lincoln the victory he needed to announce the preliminary Emancipation. The President also declared his intent to enlist "free blacks" and "emancipated slaves" in the Union Army. After Colonel Clarke's death, Nimrod continued to serve as an Army scout until March of 1864. When the 36th Ohio Volunteer Infantry was garrisoned close to Washington D.C., Nimrod went into the Capital and joined the Union Army. He was assigned to Company F, the 23rd Regiment, United States Colored Infantry and appointed 1st Sergeant of Company F. This one of the highest ranks authorized for black soldiers. The 23rd was organized at Camp Casey, Va., from November 23, 1863, to June 30, 1864. At first Attached to 2nd Brigade, 4th Division, 9th Corps, Army of the Potomac, from April to September, 1864., then to the 2nd Brigade, 3rd Division, 9th Corps, until December 1864; then assigned to the 3rd Brigade, 3rd Division, 25th Corps, until December, 1865. Finally the unit served with the 3rd Brigade, 1st Division, 25th Corps, in the Dept. of Texas. The 23rd fought combat campaigns from the Rapidan to the James River, Va., in May and June, 1864. They guarded wagon trains for the Army of the Potomac through the Wilderness from June 15-18 as they moved into position Petersburg at the Siege of Petersburg and Richmond which was begun on June 16, 1864, and lasted to April 2, 1865. They participated in the Mine Explosion at Petersburg on July 30, 1864 and at Weldon Railroad on August 18-21. Then Fort Sedgwick on September 28, Poplar Grove Church September 29-30, at Boydton Plank Road, on Hatcher's Run, October 27-28. They fought at Bermuda Hundred December 13. They remained on Duty at the Bermuda Hundred front until March, 1865. The 23rd joined the Appomattox Campaign on March 28-April 9, back to Hatcher's Run March, 29-31. Finally the Fall of Petersburg on April 2, 1865 and Pursuit of Lee April 3-9 1865. Nimrod Burke and the 23rd were at Appomattox Court House on April 9, 1865 when General Robert E. Lee surrendered the Confederate Forces. This was particularly significant for Sergeant Nimrod Burke though he probably didn't know it, but John Carter, an ancestor of General Robert Lee, had owned the slave ancestors of Nimrod Burke! The 23rd remained on Duty in the Department of Virginia until May, 1865 then moved to the Rio Grande River in Texas during May-June. Nimrod continued duty with the 23rd Regiment at Brownsville, Texas until November 30, 1865 when the 23rd Regiment was Mustered Out of Military Service. The Regiment's losses during the Civil War, were 4 Officers and 82 Enlisted men killed and mortally wounded. 1 Officer and 165 Enlisted men died from disease. The total casualties were 252.